The Greatest Story Ever Told, based on the book of the same name by Fulton Ousler, came to ABC for Goodyear Tires on January 26, 1947. This ambitious radio series, with a full orchestra and a 16-voice chorus, dramatized the life and times of Jesus Christ, "the greatest life ever lived." It was the first radio series to simulate the voice of Christ as a continuing character. Warren Parker played the part of Jesus, although none of the show's actors were ever promoted as "stars". Ouster, then religious editor of Reader's Digest, kept a strong interest in the show, meeting weekly with writer Henry Denker before scripts were prepared. They often discussed ideas in terms of modern problems, then found a corollary in the life of Christ and emerged with a theme. Denker, a long-time student of the Bible, held additional meetings with clergy of all faiths. Moreover, an inter-denominational advisory board guided the show. The stories quite effectively captured the essence of Ouster's book, a beautifully simple, popular dramatization of Christ's life as set down by four apostles. Marx Loeb was the director of the radio show, with Leonard Blair as assistant director, and it was produced by Wadill Catchings. William Stoess composed the music. Willard Young directed the orchestra and chorus. The Greatest Story Ever Told became an integrated part of school and church work. The radio show aired on ABC as an early evening Sunday show for the next decade. 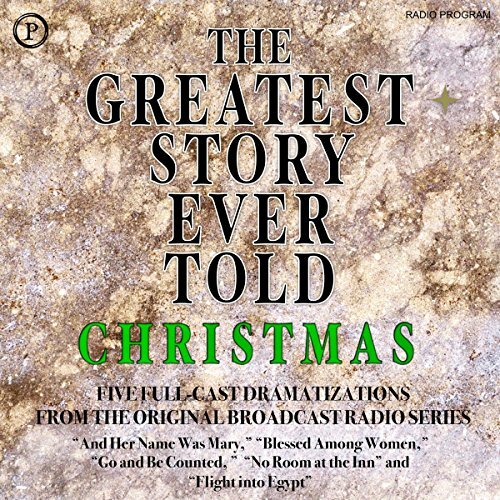 This Christmas-themed audio edition features five full-cast dramatizations from The Greatest Story Ever Told radio series: "And Her Name Was Mary", "Blessed Among Women", "Go and Be Counted", "No Room at the Inn", and "Flight into Egypt". The reason we celebrate the season.. I thoroughly enjoyed this radio drama from the 40's. They captured much of the story from the bible and added wonderful nuances to personalize the story of Jesus. I hope they release the rest of the series. ;Sit down with your kids and turn of the lights and imagine you are on the journey to Bethlehem.